We have always known that, one day, we will have to leave the United Arab Emirates. Visas are tied to jobs and sponsors, and no matter how long one lives here, eventually one will have to move on. Most people simply go back to their passport country, others move on to job opportunities in other countries, some start businesses and stay. With political turmoil and violent crime out of control, we are not keen to return to South Africa. We’ve gotten used to not being surrounded by stories of violence and hatred. Both of us have always longed for a simpler life. A life lived closer to the land. As a teenager I couldn’t wait to finish school and leave the small farming community in the middle of South Africa in which I grew up. I wanted to live and work in the city, and see the world. Ironically, as I’ve grown older, I started to long for a little piece of land on which I could grow things. I don’t have green fingers, and know nothing about growing vegetables, fruit trees, or even the lavender I always thought I’d like to grow. And so, through the years I have collected articles and books on how to live off the land, to feed this deep longing. Michael grew up in Kariba, Zimbabwe, where he was exposed to a life where wildlife roamed freely, before spending the latter part of his teenage years on a farm in South Africa. He had a secret longing to be a farmer, but life did not work out like that for him. He has always loved growing things, even when he doesn’t necessarily eat what he grows. Getting into the technical details and science of it, is not just a passion, but a compulsion. He loves the challenge of learning something new, and starting a new project is what drives him. Once up and running, with the thrill morphing into slog, he loses interest. I, on the other hand, couldn’t be bothered by the science, but I do have the stamina to see projects through. Hence we think we will make a good team on the land. In two previous blog posts I have written about our decision of buying land in Portugal, as well as resolving a land dispute, which could have derailed the process. We are currently busy converting a small ruin into a tiny house, and getting electricity connected to the land. The process is slow, because we have to manage it from a distance, and turning a dream into reality costs money. And so, for now, life in Abu Dhabi will continue as always, despite upheavals at Michael’s workplace, and various changes in the country. We still enjoy living here, and each salary brings us closer to our “life of freedom”. Having blogged about my adventures of life in the UAE, as well as other random travels, since moving here at the end of 2011, it seems natural for me to want to keep blogging. For now, Dreaming in Arabic will continue as always. Perhaps just with less travel adventures, as we channel our money and efforts towards our land in Portugal. But we’ve also set up a new platform to document this new journey as it unfolds. If you would like to follow us on our journey of realizing our dream of a life lived closer to the land, please subscribe to our website, A Taste of Freedom, or follow us on Facebook. You can also subscribe to our YouTube Channel, where I will post the odd video to supplement our blog content. Don’t expect daily or even weekly updates, though. This is not a magical journey. It is one entrenched in the struggles of daily life. We are just two ordinary people taking one tiny step at a time to transform a dream into reality. Sounds fun – count me in! I have some of those same dreams but have no green thumb myself AND no husband with scientific or technical skills, so I will live vicariously through your dreams and tastes of freedom! Thank you, Lexi. It will be interesting to see where this new adventure takes us. Some days we are impatient, and wish we could already be on the land, but we trust that even with tiny steps, we will eventually get there. Thank you very much for your kind words. There will be more posts from the Middle East, for now, as we are not relocating just yet. I have some fantasies about a little vineyard . . . 🙂 For now, we are working on saving up money to complete the infrastructure, as that is rather costly, and dreaming about all the things we will grow there one day. That is rather strange, Rob, as usually comments just go into “moderation”, and I am notified via e-mail. I will check on the back-end to see if there are any settings that can be the cause of this. As it is a website using WordPress, it functions slightly different from this blog, and I am still learning the ropes. So sorry about that. An exiting and good decision, I think. Wishing you all the best for this new life in Portugal. Thank you so much. We are quite excited about this unfolding adventure. Love following along on your journey’s whether it is your travels or your experiences in working to a life of freedom on your own little piece of land. Wishing you success, joy and fun! Thank you for your kind words, and amazing support, Terri. Not just now, but throughout the years. It means a lot. It’s interesting how one’s perspective on life changes over time. We too are in the process of finding our plot of dirt with lots of space around it. I look forward to reading about your new adventures wherever they lead you! How exciting for you, Sabine. I hope you find the perfect plot. Life really is a wonderful adventure, isn’t it? And I always marvel at our ability to grow and change. Yes, it is an adventure! Fortunately we’re not in a hurry and can explore where to settle down next! Your new journey sounds exciting! I know exactly how you feel! It’s our dream to head to a place in the mountains someday. Wishing you luck! Thank you! Hold onto your dream, and enjoy your own special journey towards it. No matter how long it may take. Best of luck to you both, Jolandi! I have subscribed to your new website and look forward to seeing how you get on. Thank you, Clare. It is much appreciated. Love that u guys think alike…..I would give my two front teeth to leave SA and live on a small island or a small country style house between somewhere and nowhere.. Thanks for the words of encouragement will certainly keep dreaming.. The UAE is definitely a great place to save up money for realizing dreams, although it is becoming more and more expensive to live here, and salaries are being cut, instead of increased. I don’t think we would have considered Portugal if it wasn’t for our friends, who bought a piece of land in the area, and kept nagging that we should come have a look too. Now that we have bought our piece of land, we are more and more convinced that the country chose us, as so much of that area reminds us of Africa. And the Portuguese are the most delightful, warm, and generous people we have ever met. The more we engage with our land, and the people in the area, the more we count our blessings. On a different note, Corlia. I suspect you and I were at university at the same time . . . I am sending you an e-mail to figure this one out. Best thing ever, Gwen! When my feet are warm, I am warm, and after having lived in a warm climate for so long, we are not prepared to take any chances in feeling cold. I agree about warm feet. I can’t get to sleep if mine are cold. And yes, it will take some time to acclimatise. After four years in England/Europe, if the weather got to 13’c I busted out the bikini and laid in the park, but if anyone had told me that when I first arrived I would have thought them stark raving mad. Ah, I love that, Gwen. It really is amazing how we get used to the weather. These days, I find 40 C very pleasant, and freeze at 24 C. We certainly are very adaptable as a species. 40′ would take me a while to get to be my preferred temp, especially if I was going in and out of air conditioned places. But a dry 30′ is extremely pleasant. The pity is that Sydney can be so humid. Hot and sticky so it feels warmer than the same temp in Adelaide, for example. I completely agree with you on the ‘hot and sticky’, Gwen. I can stomach the same temperature in a dry version far better than in the humid version. Abu Dhabi also gets very humid in summer, but what I find interesting is how my tolerance level for humidity has increased slightly over the last two years of living on the coast, after the more preferred dry heat of Al Ain. Our land in Portugal is luckily in an area with dry summers, so we are in luck. Good luck dear Jolandi! I am sorry for not commenting as much, but I have been enjoying your posts as always. I will definitely subscribe to your other site as well. Thank you for your lovely wishes, Takami. It will be lovely if you follow us on our new adventure. It is a long, slow process making this dream a reality, and I am sure we will be in transition for the next couple of years! And sending warm wishes your way too. It is always a little bit scary before taking any big step. I hope everything falls into place for you. 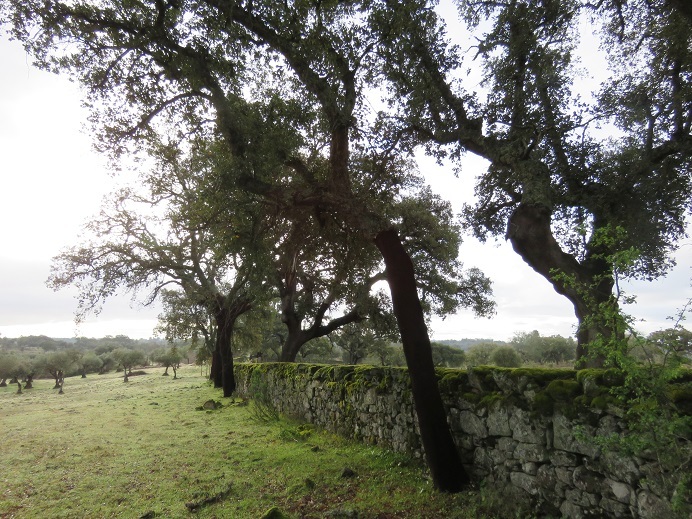 On one of my imaginary saunters through Portugal, I’ve become mired and enchanted with the soil and the dark night skies in the region you are speaking of. (In another, I fall in love with a fado songstress near Porto and learn to become a skillful interpreter of the beautiful guitarra portuguesa (have a look here if new to you: https://www.youtube.com/watch?v=H9QwByS4ZtE ).. and always the food, the food. I lived once among them in a Portuguese enclave in NJ for some years – a delightful, resourceful, industrious people with a gorgeous sounding langauge. Best Luck to you! I hope each day will bring you a little closer to your dream home. Thank you, Tanja. It is sometimes difficult to stay patient, as it often feels like things are moving too slowly. That is when we have to remind ourselves that each day is a step closer, no matter what we do. Exciting, and a little bit frightening all mixed up in one, as change, no matter how much looked forward too, always brings uncertainties and insecurities, even if it is of one’s own making. Doesn’t it? Wise words, Tanja. And thank you for your support and encouragement. It means a lot. Most excellent. I wish you all the best and much fun and joy in your new life. Thank you! It will be so different from the way we currently live. Great to connect with you again, Jolandi, always loved your travel writing. I wondered what happened to you, Safia, and was delighted to see your recent blog post. I did not realize that you were back in Ireland, but I hope that it is good for you and your family. It is interesting to hear that you felt a sense of being freed. We have enjoyed our time here, but it is also time to move on to new ventures and a ‘freer’ life. Ah, how we dream! Dreaming is always the first step, isn’t it? It will be interesting to see where we both are in two years time.